Last time I looked, alcohol consumption in France had gone from about 21 litres a head (people aged 15+) a year to about 12. The question is why. There was no doubt that the high consumption in France went along with high levels of cirrhosis and cancers of the pharynx and oesophagus linked to alcohol (breast cancer too?). When I chaired the Academy of Medical Sciences working group that produced the report, Calling Time, we concluded that population levels of consumption were influenced by price, availability, and ...well, we didn’t quite say what, ... but it was culture, structure of society...in short, all the other things that were likely to be important but were harder to nail down. In response to our report, one distinguished physician (who had been described to me, decades ago, as a Thatcherite before it was fashionable) said that this was the Nanny-State-gone-mad. Now, there’s an original thought! 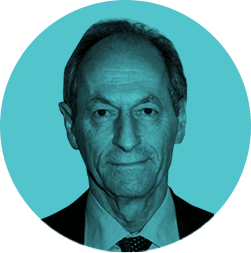 In support of his argument against government meddling (in anything), he dwelt on our report’s graph of declining alcohol consumption in France, despite the low price. 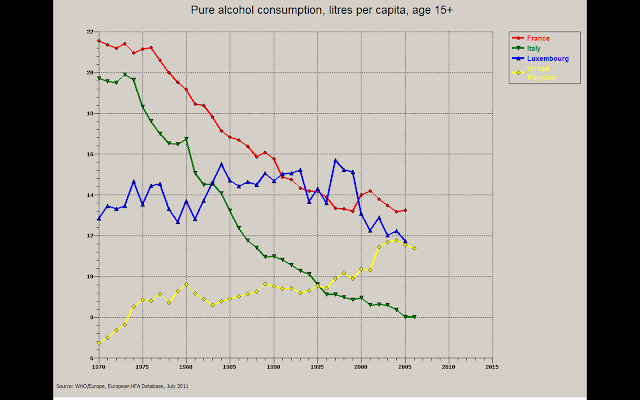 The decline in alcohol consumption in France poses interesting questions. It is reasonable to say that one of the factors in the high alcohol consumption in France is the low price. But why has consumption declined? Robin Room had said that French agricultural workers were paid, in part, in alcohol. At table, in this glorious farm house (now bed and breakfast) near Uzes in Provence, amid copious jugs of locally produced red wine – from the farm’s own grapes – we discussed it. A former couturier, now consort of the woman who runs the B and B, said that locally, the workers who picked the grapes used to be given 5 litres of wine a day for personal consumption, and the supervisor, 8 litres. That may be only a few weeks a year, but I seem to remember Robin Room’s figure was 1.5 litres of wine a day to farm workers in general. An engineer, another guest at the B and B, said that when he was growing up, post war, 60% of the French population lived rurally, presumably heavily involved in agriculture, and paid accordingly – a new understanding of liquidity; economists take note. Now, the French population is less than 20% rural. (In the UK, I think it is about 2% involved in agriculture. France has about the same population as the UK in a bigger land mass so presumably has more agriculture; plus, it was always said that one of the purposes of the EC budget was to subsidise inefficient French farmers.) Along with the decline in the proportion of agricultural workers was not just a decline in wine as a unit of wages, but a changed lifestyle. Going home for lunch in the middle of the day with alcohol, and a siesta, is going. In cities people are far more likely to work 9 to 5 (followed, it is rumoured, by ‘cinq a sept’ which is for other traditional French activities outside the home) – no home for lunch, no siesta, and less alcohol. A clamp down in drink driving may further have contributed. Part of our argument on social determinants of health is that life style is important, but we need to address the social determinants of life style. Understanding reasons for alcohol consumption in different countries must be part of that. Volunteers for participant observation? I would put my money on fashion, secular trends. Whilst health promotion advocates separate their shoulders patting themselves on the back for smoking reduction it would appear that mostly smoking has fallen out of fashion. How else can you explain plummeting rates where tobacco remains cheap and heavily promoted? No doubt all the programs and regulations supported a change already underway but they don't account for it, nor would they have worked if trends were otherwise. This is important because many think the "smoking victory" points the way for policy around obesity -- i.e. taxation, regulation and shaming. They are dead wrong. Also, for information, alcohol prices and taxes are half what they are in British Columbia across the border in Washington state. Every shop and restaurant can sell cheap alcohol south but not north of the line, many shops and bars 24 hours a day. But drinking levels and binge drinking are a much bigger problem in BC than Washington. The difference is mostly cultural, not socio-economic or demographic because both jurisdictions have very similar population profiles. "Used to be paid in alcohol" is partly inaccurate. What they have, as an obligatory perk (from the 'convention collective'), is a certain amount of wine per day which can be converted into a cash equivalent on the paycheck if preferred. It's not just the guys who work in the fields that have this particular 'avantage en nature', but anyone who works in the wine industry, apparently. But yes: changed lifestyles, and a damn fine job of health education over the years, all things considered.